The inaugural day of the International Workshop on Diversion through Restorative Justice, held on the 26th of June in Bangkok (Thailand), introduced as well the National Symposium on Ending Violence against Children in Juvenile Justice System, and the Third Meeting of the APCJJ Subcommittee for ASEAN. During this first day of the workshop, participants studied in depth the concept of restorative justice used as a diversionary measure. It started from the basic concepts, through which participants scrutinised the different practices part of the implementation process. This week of events is organized and supported by the Department of Juvenile Observation and Protection (DJOP) and the Office of Justice Affairs under the Ministry of Justice of Thailand, as well as the Thailand Institute of Justice, UNICEF EAPRO, the International Juvenile Justice Observatory through the Asia-Pacific Council for Juvenile Justice, and Thailand’s ACWC Representative on Children’s Rights. The event was opened by Mr. Sakarn Pechnarin, deputy Director General acting Director General at the Department of Juvenile Observation and Protection (DJOP) of the Ministry of Justice (MOJ), Thailand, and Mr. Wanchai Rujanawong, former Director General at the DJOP and representative of the ACWC. 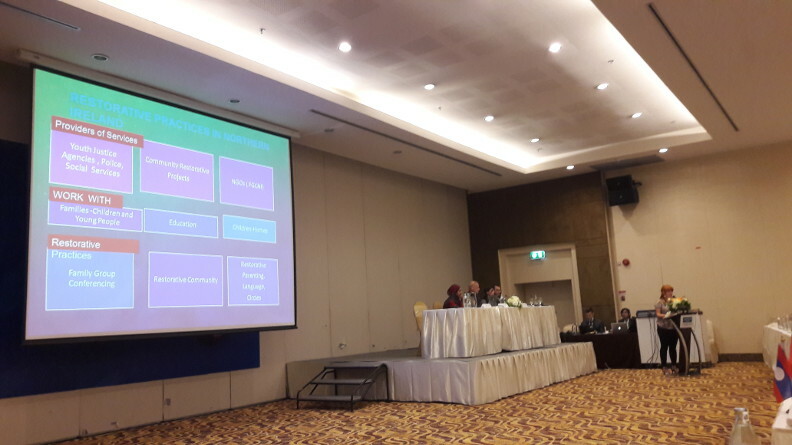 In his speech, Mr. Pechnarin emphasised the importance of this event, which gathered together many officials and practitioners who work in the juvenile justice system in many different Asia-Pacific countries, as a great opportunity for enhancing and promoting best practices on diversion and restorative justice (RJ) and enhancing cooperation and joint reflection on these themes among ASEAN countries. This was followed by an inaugural speech by Mr. Wanchai Rujanawong who gave an overview of the Thai experience in restorative justice in the form of family group conferencing, a practice introduced in the late 1990s and later on incorporated in the legislation. He spoke about the effectiveness of this instrument in lowering recidivism among young offenders, above all emphasising the importance of keeping in mind that, in all the phases of a proceeding involving a child offender, “we first need to treat the child as a child, not as an offender. He/she is somebody who has committed a crime but who deserves a second chance”. The Third Meeting of the APCJJ Subcommittee for ASEAN was then formally introduced with remarks by Mr. Cédric Foussard, the IJJO’s Director of International Affairs, who presented the trajectory and activities of the IJJO and the APCJJ, specifically with regard to restorative justice, and Ms. Raquel Jimenez, the IJJO’s Director of Projects and Research, who – after acknowledging the presence of the institutions, international and national government representatives and all the stakeholders present – presented the main key concepts of restorative justice processes, which led to a fruitful discussion on related best practices. 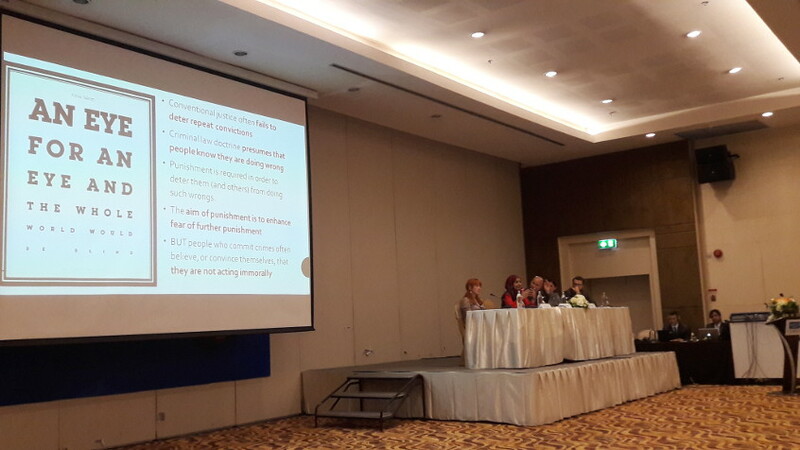 Following the introductory remarks, the first discussion panel approached the theme of the day, presenting the conceptual and theoretical framework of restorative justice, with an introduction of restorative justice’s practices, principles and safeguards, through the presentation of practices from Europe and from Singapore. The panel featured Dr. Monique Anderson, PhD researcher at the Leuven Institute of Criminology in Belgium, and Dr. Razwana Begum, from the Probation and Community Rehabilitation Service, Rehabilitation Protection Group, Ministry of Social and Family Development in Singapore. They provided the audience with the theoretical framework and presentation of the main definitions, giving an initial detailed picture about what a restorative justice process looks like. Dr. Anderson, after clarifying the key concepts and theories, presented the IJJO project she provided her expertise to: the ‘European Research on Restorative Juvenile Justice’, which outcomes are organized into three volumes (two manuals and a toolkit), and offered an overall European overview of RJ, also through case studies from Belgium and Finland. Dr. Begum then gave other insights about theory and definition about juvenile justice and restorative justice, making reference to the Singapore’s experience, which was deepened in the afternoon. At the closure of the morning session, Ms. Grace Agcaoili from the UNICEF East Asia and Pacific Regional Office presented the study ‘Diversion not Detention: A study on diversion and other alternative measures for children in conflict with the law’, which aims to address bottlenecks in the implementation of diversion and other alternative measures related to juvenile justice. The study documented promising/good practices as well as enablers and barriers for using alternative measures to detention in line with international standards, in 26 East Asian Countries. It also supported national and local authorities and juvenile justice professionals in their efforts to apply alternative measures, and developed a continuum of promising/good practices that may function as a guide for replicating and scaling-up alternative measures in the EAP region. The afternoon saw the second panel of discussion taking place, concluding the day with an overview of the restorative process through different national experiences. The panel featured Dr. Begum, who presented the restorative justice practices’ experience in Singapore, Martina Jordan, from Consensus NI Restorative Solutions, (Northern Ireland), and Rik Quint, senior advisor and project manager sports and school safety in Utrecht (The Netherlands). 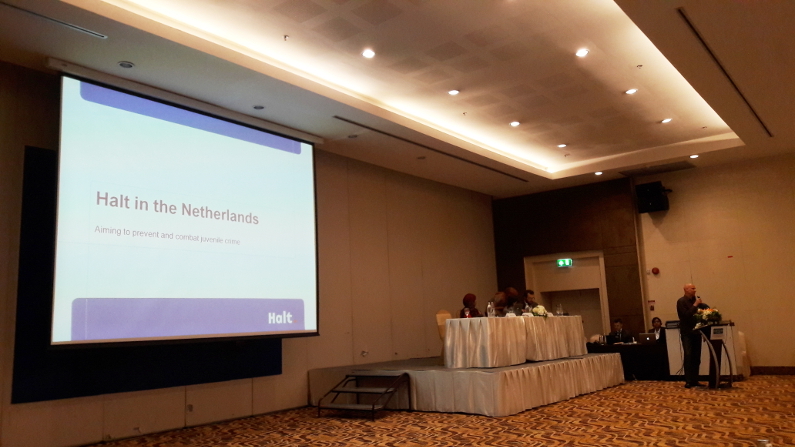 Ms. Jordan and Mr. Quint respectively presented the experience of restorative justice in Northern Ireland and the programme Halt in the Netherlands.